A succession of generation after generation of acts of division (called fission) of certain heavy nuclei. The fission process releases about 200 MeV (3.2 × 10-4 erg = 3.2 × 10-11 joule) in the form of energetic particles including two or three neutrons. Some of the neutrons from one generation are captured by fissile species (233U, 235U, 239Pu) to cause the fissions of the next generations. The process is employed in nuclear reactors and nuclear explosive devices. a chemical or nuclear reaction in which the appearance of an intermediate active species (free radical, atom, or excited molecule in chemical chain reactions and neutron in nuclear processes) causes a large number (chain) of transformations of the original molecules or nuclei as a result of the regeneration of the active species in each chain step. (For a discussion of nuclear processes, seeCHAIN REACTION, NUCLEAR). In the chemical unbranched chain reactions studied thus far, the active species are free atoms and radicals that are readily capable of reacting, with a low activation energy, with the original molecules, generating a new active species along with a product molecule. In chemical branched chain reactions, excited molecules may also serve as active species, while in degenerate branched reactions (see below), unstable molecules of intermediates may serve as well. Unbranched chain reactions. Let us examine chemical processes with unbranched chains using as an example the photochemical reaction between hydrogen and chlorine. In this chain reaction, a chlorine molecule, absorbing a quantum of light, decomposes into two atoms. Each of the chlorine atoms formed initiates a chain of chemical transformations, in which the chlorine and hydrogen atoms serve as the active species. The chain may be very long, the number of repeating elementary chain propagation reactions per single generated active center reaching tens and hundreds of thousands. Chain termination occurs as a result of the recombination of atoms within the reaction vessel, the capture of atoms by the vessel wall with subsequent recombination on the wall, and the formation of an inactive radical in a reaction of active centers with the molecules of impurities, which are always present [as, for example, in the reaction, between atomic hydrogen and oxygen molecules (impurities) with the formation of the HO2 radical; the radical under conditions of not very high temperatures does not react with the original molecules]. In the final two steps, M is any third species (atom or molecule) that is required to remove a portion of the energy of the Cl2 and HO2 species formed and thus render their reverse decomposition impossible. The rate of chain reactions is extremely sensitive to the rates of initiation and termination and thus depends on the presence of chemical impurities, on the material and condition of the walls of the reaction vessel, and on the vessel’s size and shape. where w0 is the rate of chain initiation, v is the chain length, and Wp and Wt are the rates of chain propagation and termination, respectively (Wt may be a compound term reflecting various ways of chain termination). Many reactions of practical importance proceed according to an unbranched-chain mechanism, in particular, chlorination, a number of liquid-phase oxidation reactions of organic compounds, and thermal cracking. Polymerization is a characteristic process with unbranched chains, in which the reaction chain also determines the length of the polymer molecule. The formation of active species necessary for chain initiation occurs as a result of a break in the single bond of a molecule and is always linked to energy consumption. Free radicals may be obtained at the expense of external energy sources, such as a quantum of light absorbed by a molecule in a photochemical reaction, as well as at the expense of the energy of electrons formed in an electrical discharge or the action of alpha, beta, and gamma radiation. The formation of free radicals at the expense of the internal thermal energy of a system is of greatest practical importance. However, the bond energy in most molecules is large, and thus the energy for the direct dissociation of molecules into radicals is great. Therefore, chain reactions are initiated by the direct decomposition of the starting molecules only at more or less high temperatures. Often, chain initiation occurs with the participation of various trace initiators, which may be molecules with a weak bond, which upon decomposition yield radicals that initiate chains or molecules that readily enter into oxidation-reduction reactions; for example, Fe2+ + H2O2→Fe3+ + OH– + OH. Initiation may also occur on the wall of the reaction vessel. In this case, the activation energy is lowered owing to the utilization of the adsorption energy of one of the radicals in the system. Chains may also be initiated as a result of reactions between molecules. Some of these reactions occur sufficiently rapidly even at moderate temperatures; for example, F2 + C2H4 → F + C2H4F. The concept of unbranched chain reactions grew out of the work of the German scientist M. Bodenstein, who discovered (1913) that in a series of photochemical reactions, a single absorbed quantum of light causes the transformation of many molecules. In particular, in the formation of HCI from H2 and Cl2, each absorbed quantum on the average accounts for up to 1 million HCl molecules. Since one quantum can activate only one molecule, the remaining molecules must enter the reaction without the direct action of light. The mechanism of this reaction was proposed by W. Nernst (1916). The modern theory of unbranched chain reactions was developed by Bodenstein’s school, as well as by Soviet scientists. Branched chain reactions. Reactions in which the chains branch have very special properties. Such reactions were discovered in the period 1926–28 by a group of physicists in Leningrad for the case of the oxidation of phosphorus vapor. It was found that for a small change in any parameter of the reaction system (reagent concentrations, temperature, vessel size, impurities) and even upon dilution with an inert gas, a practically imperceptible reaction abruptly becomes a rapid, self-accelerating spontaneouscombustion-type process. This phenomenon was observed even at low temperatures, when the rate of initiation of such processes is extremely low, and even under conditions when a thermal explosion is impossible. Thus, outside the combustion region (see Figure 1, p. 82), the reaction practically does not occur. N. N. Semenov and his co-workers were the first to provide an explanation for this paradoxical observation and propose a quantitative theory of branched chain reactions. Also of great importance in the development of concepts in branched chain reactions was the pioneering work of C. N. Hinshelwood and his co-workers on the upper combustion limit. Semenov and Hinshelwood were awarded a Nobel Prize in 1956 for the investigation of the mechanisms of chemical reactions. More than one new active center (often three centers) is generated in the course of a branched chain reaction upon the interaction of one of the active centers—chain propagation occurs. In addition to the active centers H and OH formed in reactions (1)–(3), which provide for the development of an unbranched chain, an oxygen atom is formed in reaction (1), which formally possesses two free valences and which is capable of readily entering into reaction (3) with the formation of H and OH, two additional chain carriers. This type of process has been called material branching. In reactions (2) and (3), in addition to hydrogen and fluorine atoms, vibrationally excited HF* molecules, which transfer their excess energy to hydrogen molecules [reaction (4)], are formed. As a result of the collision between the energy-rich H2* molecule and the F2 molecule, an HF molecule and H and F atoms are formed [reaction (5)], which initiate new chains (energy branching). Experimental data obtained in the USSR in the 1970’s seem to support Semenov’s idea (1934) on the possibility of energy branching with the participation of electron-induced species. where k is the constant of the reaction rate of the active center with the starting compound, [A] is the concentration of the starting compound, w0 the rate of chain initiation, f and g are the effective constants of the rates of branching and termination, respectively, e is the natural logarithm base, and t is time. When (f – g) > 0, the concentration of the active centers and the rate W increase at an avalanche-like rate over time. If, on the other hand, (f – g) < 0, then the concentration of the active centers and thus the reaction rate are very low, since the chain initiation rate w0 is low. The transition from one reaction mode to another occurs abruptly at the critical condition (f – g) = 0. The chain branching rate is proportional to the concentration of the molecular reagent that enters the reaction with the active center. At the same time, the rate of heterogeneous chain termination on the vessel wall, depending on the state of the wall’s surface, may be independent of the concentration or may decrease with increasing concentration of the gas-phase mixture. Thus, upon an increase in pressure, beginning with a certain value (the first limit), f becomes larger than g, and self-combustion of the mixture occurs. If chain termination occurs upon ternary collisions, the termination rate is proportional to the product of the total concentration of the mixture and the concentration of the starting reagent, which forms an inactive radical with the active center. With a further increase in pressure (the upper limit), termination predominates over branching (f < g), and combustion does not occur. The pressure at which f = g is called the critical pressure. For similar reasons, a critical temperature of self-combustion also exists for branched chain reactions. Since the branching rate depends more on the temperature than on the termination rate, the combustion region expands with increasing temperature. 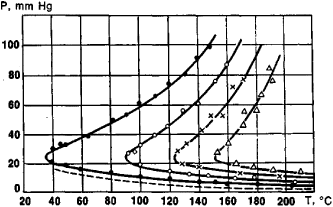 Curves that express the critical pressure as a function of temperature have the form of the peninsula of chain combustion (see Figure 1). Figure 1 depicts the combustion peninsulas for the oxidation of silane at various silane concentrations in oxygen. A similar picture is observed for practically all oxidation reactions and many fluorination reactions. The experimentally observed curves correspond totally to theory. In the case of heterogeneous termination, the value g and thus the rate of annihilation of active centers are proportional to the ratio of the inner surface of the vessel to its volume, that is, inversely proportional to the diameter of the vessel. Thus, there is a critical diameter. For diameters slightly larger than the critical diameter, the reaction proceeds with combustion, but at smaller diameters, the reaction is practically absent. If in mixtures the values of f and g are close but nevertheless f < g, then such mixtures may ignite upon the addition of an inert gas. The addition of an inert gas while the concentration of reagents remains unchanged hinders the diffusion of the active centers to the vessel walls, thereby reducing the rate of termination (g). If an impurity is present in the system with which the active centers react and then are annihilated, then, above some critical concentration of this impurity, chain termination predominates over branching and the mixture does not ignite. Below this critical concentration of the impurity, combustion of the mixture may occur. Theory permits the calculation of the change in the concentration of the active centers over time. These calculations show that near the maximum rate of the chain process, the concentrations of active centers may reach enormous values, far in excess of their thermodynamic equilibrium concentration (evidently, toward the end of the process, the concentrations of the active species become infinitesimal owing to the recombination of atoms and radicals). Indeed, in accordance with theory, in various branched chain reactions, atoms and radicals have been observed directly at concentrations comparable to the concentrations of the starting compounds. Thus, in the decomposition of NCl3 at room temperature and low pressures, the concentrations of the intermediate active species (chlorine atoms) reach 40 percent of the initial NCl3 concentration. In 1939, V. N. Kondrat’ev and his co-workers, in a study of the hydrogen-oxygen flame, and later N. M. Emanuel’, in a study of the hydrogen sulfide-oxygen flame, first showed that the concentrations of active centers in flames exceed their thermodynamic equilibrium values by many orders of magnitude. Subsequently, V. V. Voevodskii and his co-workers were the first to make use of electron paramagnetic resonance to identify atoms and radicals in flames, a method now used in the study of various branched chain reactions. It is not excluded that the scope of chemical processes that occur by the mechanism of a branched chain reaction is broader than is usually assumed, and much still remains to be studied. For example, for a large increase in the rate of recombination of the active centers with one another, branched chain processes may imitate the regularities of the simple types of reactions. It is difficult to establish a chain mechanism under such conditions, but it has been done for the case of the liquid-phase oxidation of compounds of bivalent tin. Critical phenomena, which to some extent are analogous to those described above, are observed in some heterogeneous catalytic reactions. Chemical and nuclear reactions are not the only branched chain reactions. The phenomenon of coherent laser radiation, for example, is also a branched chain process. Degenerate branched chain reactions. Degenerate branched chain reactions were predicted, discovered, and subsequently studied in detail at the Institute of Chemical Physics of the Academy of Sciences of the USSR. In the development of unbranched chains, an intermediate molecular peroxide-type product is frequently formed, which relatively easily but still not too rapidly decomposes into free radicals that initiate additional new chains. In this case, greatly delayed branching occurs, and a slow, self-accelerating reaction proceeds, called a degenerate branched reaction. Such reactions are accompanied by a prolonged induction period (more precisely, a latent self-acceleration period), sometimes lasting several hours. They include the oxidation of hydrocarbons and many other organic compounds. Many degenerate branched reactions in the gas and liquid phases are also characterized by limiting (critical) phenomena, but such effects are not manifested as often as in ordinary branched chain reactions. Unique degenerate branched reactions occur in solids, for example, in the slow thermal decomposition of ammonium perchlorate crystals. The direct decomposition of the initial compound in the crystals proceeds with difficulty and begins at defects, most often at dislocations, along which the final gaseous or solid products are formed. Mechanical stresses appear during these reactions at dislocations, and these stresses generate new dislocations; thus, the number of dislocations grows, which may resemble a degenerate branched reaction. The discovery of branched and degenerate branched chain reactions was of great importance for the development of the theory of combustion processes. It was proved that only two types of combustion exist: chain combustion and thermal combustion. The theory of chain processes lies at the foundation of the control of combustion processes and plays a large role in several areas of modern industrial technology. Semenov, N. N. Tsepnye reaktsii. [Leningrad] 1934. Semenov, N. N. O nekotorykh problemakh khimicheskoi kinetiki i reaktsionnoi sposobnosti, 2nd ed. Moscow, 1958. Semenov, N. N. Razvitie teorii tsepnykh reaktsii i teplovogo vosplameneniia. Moscow, 1969. Semenov, N. N. “On the Possible Importance of Excited States in the Kinetics of Chain Reaction.” In Douziéme Conseil de chimie tenu á L’Université Libre de Bruxelles. New York—Brussels, 1962. Hinshelwood, C. N. The Kinetics of Chemical Change. Oxford, 1942. Nalbandian, A. B., and V. V. Voevodskii. Mekhanizm okisleniia i goreniia vodoroda. Moscow-Leningrad, 1948. Emanuel’, N. M., E. T. Denisov, and Z. K. Maizus. Tsepnye reaktsii okisleniia uglevodorodov v zhidkoi faze. Moscow, 1965. Kapralova, G. A. [et al.]. “Eksperimental’nye dokazatel’stva razvetvlenii v tsepnykh reaktsiiakh molekuliarnogo ftora.” Kinetika i kataliz, 1963, vol. 4, issue 4. Semenov, N. N., and A. E. Shilov. “O roli vozbuzhdennykh chastits v razvetvlennykh tsepnykh reaktsiiakh.” Kinetika i kataliz, 1965, vol. 6, issue 1. Kondrat’ev, V. N. Spektroskopicheskoe izuchenie khimicheskikh gazovykh reaktsii. Moscow-Leningrad, 1944. “Eksperimental’nye dokazatel’stva razvetvlenii v tsepnykh reaktsiiakh molekuliarnogo ftora.” Kinetika i kataliz, 1963, vol. 4, issue 4. Azatian, V. V., R. R. Borodulin, and E. A. Markevich. “Identifikatsiia atomov khlora v razrezhennom plameni trekhkhloristogo azota.” Kinetika i kataliz, 1974, vol. 15, issue 6. A chemical reaction in which many molecules undergo chemical reaction after one molecule becomes activated. Chain Reaction adult supervisor Madeline Bietsy said Gnish is a take-charge sort of youngster. Serological, reverse transcriptase-polymerase chain reaction, and immunohistochemical detection of West Nile virus in a clinically infected dog. Using both immunoassay and reverse transcriptase polymerase chain reaction (RT-PCR) methods, the Company's scientists are continuing to refine the methods for detecting the NMP66 complex in the blood of women with breast cancer. Skin and pharyngeal swab were positive by reverse transcription--polymerase chain reaction, showing 965-bp (Modling) and 300-bp (CDC) DNA amplicons of the rabies virus nucleoprotein gene closely related to other strains from Morocco (GenBank accession nos. The Chain Reaction competition will definitely do that," said Brandon Peterson, special events manager, Angel Fire Resort. RNA in ticks (Ixodes ricinus) by the polymerase chain reaction. Simi Valley doesn't have a March of Dimes office, but it does have a Chain Reaction Council youth program. On these particles, inactive chlorine chemicals readily assume an active form that participates in an ozone-destroying chain reaction. A semitrailer truck driver died Monday night in a four-vehicle chain reaction pileup on the Tri-State Tollway near Rosemont. After settling in the United States, he continued his work, primarily in partnership with Niels Bohr, who first suggested a nuclear chain reaction was possible.